Upon your arrival at Tribhuvan International Airport (TIA) in Kathmandu, a representative of our organisation will pick you up and transfer you to the hotel. During a welcome dinner in the evening your guide provide you a detailed briefing on your upcoming tour so that you are well prepared for the trip and any last-minute question will be answered. In the morning you visit the "monkey temple" Swayambunath, an important place for buddhist pilgrims with a small stupa. Then you drive to Pashupatinath, a famous pilgrimage place for Hindus, located at Bagmati river. Every week come plenty of people from whole Nepal and India to pray there. Then you visit the biggest stupa in the world located in Bodhnath. Many Tibetan people come here to circle the stupa and pray. Pokhara is located next to Phewa Lake and offers a great view of the Himalaya. After having lunch you have free time to go shopping at the lakeside with its numerous small shops, or you can make a boat trip. You have to wake up early in the morning and drive to the view point Sarangkot by taxi. From there you get an fantastic view of the mountains and enjoy the sunrise. After breakfast you drive about 1 ½ hours to the small village Dhampus. If you like, you can only drive until Phedi and hike from there about 1 ½ hours to Dhampus. In the morning you can enjoy the awesome sunrise and after having lunch drive back to Pokhara (optional hike). From there you go to the other side of the lake by boat and hike about 200 meter up to World Peace Pagoda. The path leads through shady forest and offers great views of Phewa Lake and Pokhara down and the mountains in front of you. After arrival at your hotel and few time to rest, you explore the old town of Kathmandu and visit Kathmandu Durbar Square with its numerous temples. The Kumari-, Bhairav- and Taleju temple with their pretty woodcraft are especially nice. Then you explore the touristic quarter Thamel, with its numerous small shops and restaurants, a great place for shopping. Tashi Delek and Welcome to the 'Roof of the World'! Our tour leader will pick you up at the hotel and fly with you to Lhasa. The flight from Nepal to Lhasa is considered one of the most beautiful air routes in the world, as it provides sweeping views of Everest (8848m), Kanchenjunga (8536m) and other Himalayan peaks. After arrival you will be transferred to the hotel and the guide will give you more information about the hotels, the transportation in the next days and general information regarding the "City of Sunlight". 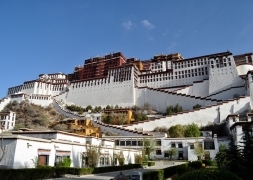 Then you have free time to discover the holy city Lhasa on your own. Tip: Drink a lot, especially water. It helps you to acclimatize. 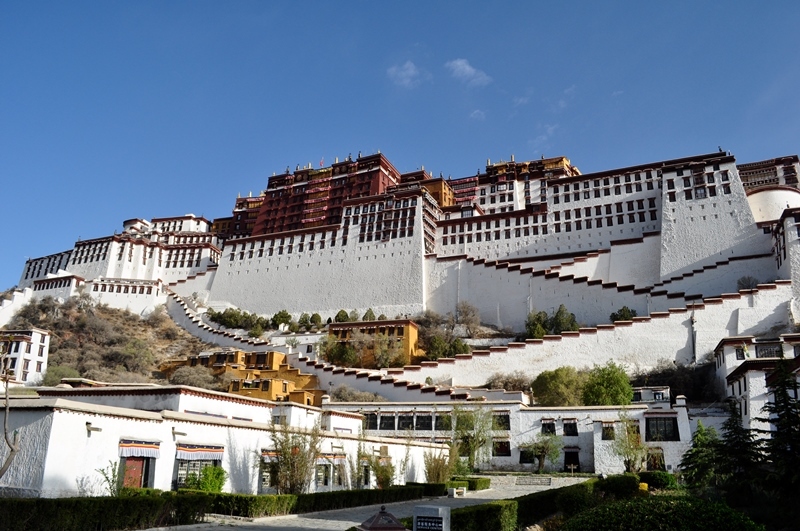 The highlight of the day is the visit of Potala palace – an UNESCO World Heritage celebrated for its priceless treasury of Buddhist artifacts and bejeweled tombs of the past of Dalai Lama. From there you can take great pictures of Lhasa's urban areas, because it is located 3650m above sea level. After that you will visit Jokhang temple, which is in walking distance to Potala Palace and is names as the spiritual heart of the capital. You will see many pilgrims worship within or nearby the temple. Enter the first floor of the temple and absorb the religious atmosphere, you will see pilgrims are donating butter oil to keep the lights burning for the Buddha. Then you will visit Barkhor next to the monastery. The pilgrims run in a circle here while praying. The holy route is also a bazar, so that the pilgrims can buy something during praying. Today you drive to Sera Monastery, which is located little bit out of the city. Here young monks are teached. During the philosophy seminar, which takes place every day at 15.30pm in the garden of the monastery, the monks practice debating. This custom you can find nowhere else in the world. Then you drive further to Ganden monestary, which is located about 35km far from Lhasa with a breathtaking position on a cliff. It is the most important sanctuary of the Gelukpa sect of the tibetan buddhism. You recognize the monks because of their yellow or black hats on their heads. During a round tour in Ganden you have a good view of the Kyichu valley and the snow-covered peaks in the distance. Then you drive back to your hotel in Lhasa. Today in the morning you leave Lhasa and drive to Gyantse. On the way you see buddhist monasteries, pituresque villages, and camps of nomadic people who tramp with their goats and yaks. After some time you reach the first pass, Kamba-La with a height of 4.795 meter and many prayer flags waving in the wind. From their you have a great view of the azure Yamdrok-Tso Lake. This lake is located at a height of 4.488 meter and is one of the 4 holy lakes of Tibet. After lunch break in one of the villages you drive further to the next pass Kora-La (5.045m). From here you can see the first really high peaks (about 7.000m) and glaciers. In the afternoon you reach Gyantse (3.950m), which was ealier an important trading post between Tibet, India, Nepal, Bhutan and China. If you like you can explore the village, visit the monastery and the fort. After breakfast you visit the Pelkor Chode Monastery and the Kumbum Stupa in the old part of the town. The Kumbum Stupa (= "house with 100.000 Buddha-figures) is an interesting museum. Then you drive via Shigatse to Sakya. In the afternoon you have time to explore the town with its Gompa, one of the biggest monestaries of Tibet with striking colours, prayer wheels and chapels. In the morning you will visit Sakya Gompa. From its roof you have a great view. Then you leave the inhabited part of Tibet and drive in the direction of Mount Everest Base Camp. The villages become smaller and smaller and the chinese influence lesser. Your trip leads you over vast, grass-grown high plateaus and small farming villages. In between you cross some of the highest passes in the world - a breathtaking experience. Sometimes you can see herders with their yaks or colourful trucks on their way to Nepal. Near to Shegar you leave the friendship highway. The countryside becomes wider, the mountain peaks whiter and in the end of the day you reach Rongbuk monastery which is, with a height of 4.980 meter, the highest monastery in the world. You will stay in the Rongbuk guesthouse, next to the monastery in a simple room without shower. Today will be straining, but unforgettable. You visit the Mount Everest Base Camp with a height of 5.200m. Mt. Everest, Chomolongma in Tibetan, is with 8.848m the highest mountain on earth. In summer (july-semptember) the mountain climbers meet here, to risk the dangerous climb to the top of the world. If you want you can hike the last 8km to the base camp, so that you get to know, how strenous it is, to walk in this height. After this experience we have even more respect for the climbers. But you do not have to walk. If you want you can drive to the camp by bus. In the afternoon you drive further to Saga. From Zhangmu you drive via Dhulikhel to Bhaktapur. The change of the landscape is dramatic. From the everlasting glaciers of the Everest and the majestic width of the tibetan high plateaus down to the gorges of Nepal. The intensive green of the fields and the new smells are part of a fully different world. Only few hours after leaving Tibet, it seems like a dream. After breakfast you explore the ancient kingdom Bhaktapur together with your guide. The gorgeous temples and artful woodcraft remind you of the past. In the afternoon you have some time left to bargain in the shops. In the evening you have a farewell dinner together. Depending on your flight time, you can buy last souvenirs in the morning or just relax in your hotel. Then you will be transferred to the airport and fly back home. Personal expenditure: e.g. drinks, souvenirs, laundry, snacks, etc. Explore Nepal and Tibet within one tour and visit Everest Base Camp.